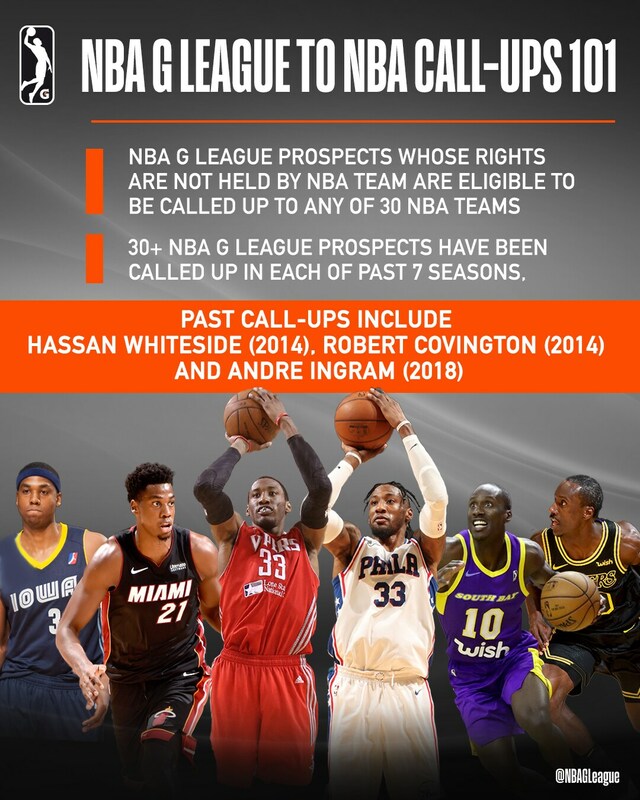 NBA G League prospects – players whose rights are not owned by NBA teams – are free agents eligible to earn a GATORADE Call-Up to the NBA. More than 30 prospects have been called up in each of the past seven seasons. Past Call-Ups have included current NBA standouts Chris Andersen — the league’s first-ever Call-Up to the Denver Nuggets in 2001 — Danny Green (Reno Bighorns to San Antonio Spurs in 2010-11), Gerald Green (Los Angeles D-Fenders to New Jersey Nets in 2010-11), Hassan Whiteside (Iowa Energy to Miami Heat in 2014-15), Robert Covington (Grand Rapids Drive to Philadelphia 76ers in 2014-15), Yogi Ferrell (Long Island Nets to Dallas Mavericks in 2016-17) and Andre Ingram (South Bay Lakers to Los Angeles Lakers in 2017-18). Click here for the list of GATORADE Call-Ups from past seasons. NBA G League 101: How Do Call-Ups Work? Signed NBA contract. Official Release. Signed to 10-Day contract. Official Release. Signed to an NBA contract. Signed for remainder of season. Official Release. Signed for rest of the regular season. Signed 10-Day contract with Miami Heat. Official Release. Signed 10-Day contract. Official Release. Signed to 10-Day Contract with Lakers. Signed 10-day contract with Nets. Signed 10-day contract with Rockets. Signed 10-day contract with Oklahoma City Thunder. Official Release. Signed to 10-day contract with New York Knicks. Signed two-way contract with the Detroit Pistons and Grand Rapids Drive. Signed Two-Way Contract. Official Release. Signed two-way contract with Memphis Grizzlies. Signed two-way contract with the Cleveland Cavaliers. Signed to Two-Way Contract. Official release.